Garden of Aaron: Prague in December?! Prague viburnum (Viburnum x pragense) blooming in December! A couple of days ago, I was very surprised to find Prague viburnum (Viburnum x pragense) in bloom! As far as I know, Prague viburnum is supposed to bloom in May. I think our recent stretch of unseasonably warm weather has thrown this plant for a loop! Interestingly, only one of the Prague viburnums (out of four) is blooming -- and even the one that's blooming only has one branch in bloom on the south side of the shrub, which naturally gets the most warmth and sunshine. As the name suggests, Prague viburnum was bred in Europe. I can't recall off-hand if its parents are Asian, European or mixed, but it's definitely not a native plant. Interestingly, none of the native shrubs (Fothergilla, Hydrangea quercifolia, Viburnum dentatum, etc.) are in bloom. Perhaps they're more accustomed to the vagaries of Tennessee weather and are thus disinclined to push out blooms that are likely to get frozen off next week? 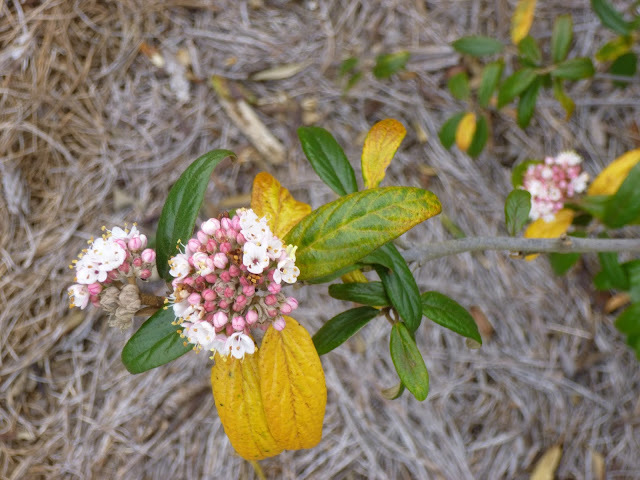 Are any of your shrubs - native or non-native - blooming out of sync with the season?